It was pointed out that in 1998 an inspector had refused an application by SCC to fence the northern part of the common on the grounds that it was “the unfenced and ungated nature of the common which distinguished it from most of the countryside”. This was scheduled for two days but ran for four ending on Friday 20th April. It was well attended, particularly on the first day with over a hundred people signing in, opponents to the fencing easily exceeding supporters. The venue, criticised before the Inquiry as being inaccessible to Chobham people without a car, also had a defective sound system and very poor acoustics so that many people struggled to hear what was being said. The Inspector is required to weigh-up the alleged benefits to the Common from grazing versus the harm done to the neighbourhood by fences, gates and cattle. Witnesses for the Surrey Wildlife Trust from Natural England admitted under cross examination that there would be little benefit to the Common from the current application and the intention was to acclimatise the public to the presence of cattle, so that in four years time, the Common boundary could be fenced and the animals left to roam at will. 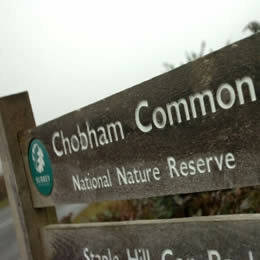 The Chobham Common Defence Group’s advocate, Mr Ashley Bowes drew the Inspector’s attention to the fact that it is unlawful to erect fences or other structures on the Common without good cause. The scheme, described as a pilot was merely a public relations exercise to condition the public to area-wide grazing in the future, the claimed benefits of this to the Common being unproven and purely anecdotal. Many villagers who gave evidence stressed that the rights of people including with dogs and horses should be respected in at least equal measure to wildlife and called for scientific studies of alternatives to fencing in order to try and avoid conflict with the village in future. It was also pointed out that in 1998 an inspector had refused an application by SCC to fence the northern part of the common on the grounds that it was “the unfenced and ungated nature of the common which distinguished it from most of the countryside”.